Japanese encephalitis (JE) virus is transmitted to humans primarily through the bite of an infected mosquito. JE occurs in many areas of Asia, especially in the south east and in parts of the western Pacific, and is the leading cause of viral encephalitis in Asia. Transmission of JE virus occurs primarily in rural agricultural areas. The risk for acquiring JE is low for most travellers, particularly for short-term visitors to major urban areas. Most JE infections are asymptomatic. Only a small percentage of people infected with JE virus develop clinical disease. When encephalitis occurs, it is usually severe, with 20% to 30% mortality rates and residual neuropsychiatric problems in 30% to 50% of survivors. The most commonly reported adverse events following JE vaccination are injection site tenderness, redness and hardening; headache; myalgia; and fatigue. JE vaccine is recommended for adult travellers with a high exposure risk going to JE endemic/epidemic areas during the transmission season and for laboratory personnel who work with JE virus. JE vaccine is not authorized for use in children less than 18 years of age but may be considered in high risk circumstances. Give JE vaccine as two separate 0.5 mL doses on days 0 and 28. Short-term (less than 1 month) travellers whose visits are restricted to major urban areas are at minimal risk for JE. An inactivated Vero cell culture-derived Japanese encephalitis (JE) vaccine with a revised dosing schedule has become available for persons 18 years of age and older. Inactivated mouse brain-derived JE vaccine (JE-VAX® [Sanofi Pasteur Ltd.]) is no longer available in Canada. In Canada, JE vaccine is not authorized for use in persons less than 18 years of age. For additional information, refer to the Committee to Advise on Tropical Medicine and Travel (CATMAT) Statement on protection against Japanese encephalitis. Japanese encephalitis (JE) is caused by a ribonucleic acid (RNA) virus from the family Flaviviridae. The virus in primarily maintained in an enzootic cycle that typically involves the Culex mosquito and wild birds. Secondary epizootic cycles can lead to infections of humans, often with domestic pigs as an amplifying host. JE virus is transmitted to humans primarily through the bite of an infected mosquito. Mosquitoes acquire the virus from infected hosts (e.g., pigs and wild birds) and then transmit the virus to non-infected hosts (e.g., humans and horses). The principal vectors are Culex species mosquitoes that tend to bite in the evening and night. So called day-biting species predominate in some regions, but they not only bite in the day; they can also bite during the afternoon or evening. Larvae of Culex mosquitoes develop in standing water, such as rice fields. Thus, transmission of JE virus occurs primarily in rural agricultural areas where flooding irrigation is practised; however, cases have been occasionally reported from urban areas. Humans usually do not develop sufficient viremia to infect mosquitoes, and direct person-to-person spread of JE does not occur except, rarely, through intrauterine transmission. Based on experience with similar viruses, transmission could theoretically occur through blood transfusions or organ transplantation. The incubation period is 5 to 15 days. participating in outdoor activities such as camping, hiking, cycling or fieldwork, especially during the evening or night. In most temperate areas of Asia, JE virus transmission is seasonal and disease usually peaks in summer and fall. In the subtropics and tropics, transmission patterns vary and cases can occur sporadically or year-round. Most JE infections are asymptomatic. Only a small proportion of people infected with JE will develop clinical symptoms. Less than 1% of people infected with JE virus develop clinical disease. In endemic areas, disease occurs primarily in children. Acute encephalitis is the most commonly identified clinical syndrome with JE virus infection. When encephalitis occurs, it is usually severe, with 20% to 30% mortality rates and residual neuropsychiatric problems in 30% to 50% of survivors. Milder forms of disease can occur and are reported more commonly among adults. JE acquired during pregnancy carries the risk of intrauterine infection and miscarriage. JE occurs in many areas of Asia, especially in the south east and in parts of the western Pacific, and is an important cause of viral encephalitis in Asia. The World Health Organization (WHO) estimates that more than 50,000 JE cases occur annually, with 10,000 deaths and 15,000 cases of long-term neuropsychiatric sequelae. The incidence of JE varies widely from year to year and between regions within countries. In endemic areas, JE usually affects children living in rural areas. However, even in countries with effective childhood JE immunization programs, JE may present a risk to non-immune travellers because transmission is maintained in an enzootic (i.e., wildlife) cycle. The overall risk for JE among persons from non-endemic countries travelling to Asia is estimated to be less than one case per 1 million travellers. However, the risk for JE among persons who stay for prolonged periods in rural areas with active JE virus transmission may reach levels similar to that of the susceptible resident population (1.2 to 2 cases per 100,000 per week). Short-term (less than 1 month) travellers whose visits are restricted to major urban areas are at minimal risk for JE although rare case reports suggest that even short-term, resort-based travellers can occasionally contract JE. There have been few cases of JE reported among Western travellers. View a map of the areas at risk for JE transmission is available throughthe United States Centers for Disease Control and Prevention (CDC) or the World Health Organization (WHO). 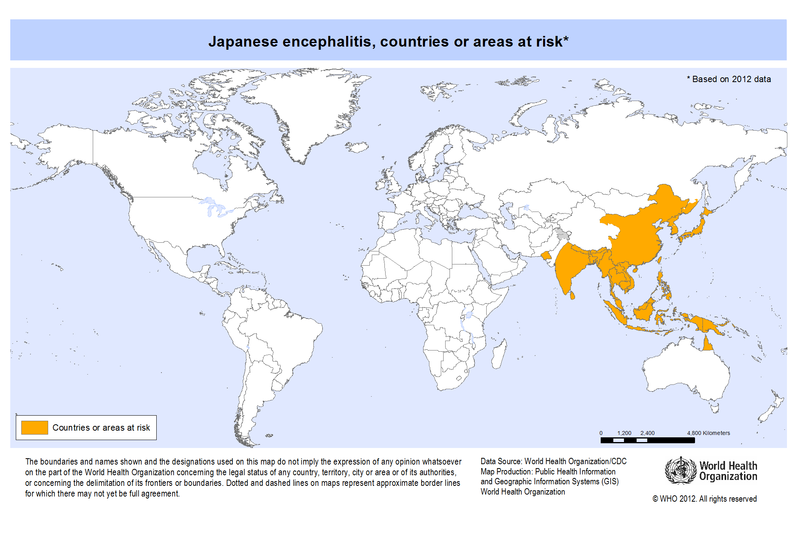 Japanese encephalitis has been known to occur in many countries, including China, India, Indonesia, Thailand and Vietnam. Risk can vary within areas and at time of year. In addition, JE risk may change over time. It is recommended that travel health practitioners access up-to-date risk information through the United States Centers for Disease Control and Prevention (CDC) Infectious Disease Related to Travel or the most current version of the CDC's Health Information for International Travel Yellow Book. To date, there has been one possible case of JE reported in a Canadian returning from Asia in 1982. For complete prescribing information, consult the product leaflet or information contained within Health Canada's authorized product monographs available through the Drug Product Database. Refer to Table 1 in General Considerations in Part 1 for a list of all vaccines available for use in Canada and their contents. No efficacy or effectiveness data exist for the Vero cell culture-derived JE vaccine, IXIARO®. IXIARO® was authorized for use based on non-inferiority of serologic response compared to the previous mouse brain-derived JE vaccine and to the WHO threshold for protective antibody titre. A single dose of JE vaccine induces sufficient protective antibodies in 30% of vaccinees at 10 days after vaccination and in 40% of vaccinees at 28 days post-vaccination. A second dose of vaccine given at 28 days after the first dose induces antibodies in about 95% of vaccinees at 28 days after the second dose. Vaccination with two doses of vaccine at the same time may increase the seroconversion rate to 60% at 10 days post-vaccination. The protective antibody concentration declines over time with 80% to 95% of fully immunized vaccinees maintaining an adequate concentration at 6 months after the first dose and 60% to 80% maintaining adequate antibodies at 12 months after the first dose. A booster dose of vaccine, among those who have completed a properly spaced primary series, induces an adequate antibody concentration in those who have lost protective antibodies at 12 months after their first dose. JE vaccine is only one part of the prevention strategy for Japanese encephalitis. All travellers going to JE endemic areas should be advised regarding personal protective measures. These measures may be sufficient to reduce an already small risk of JE to a level at which JE vaccine provides little added benefit. For additional information on alternative preventive tactics and strength of recommendations for vaccination, refer to CATMAT Statement on protection against Japanese encephalitis. JE vaccine is not authorized for use in persons less than 18 years of age due to little safety and efficacy data in this population. The pediatric traveller, especially the longer-term traveller, to areas endemic for JE may be at risk for JE infection and serious complications. If travel cannot be avoided or deferred, travellers less than 18 years of age should be advised to diligently use protective measures to prevent mosquito bites. When a child will be spending a prolonged period of time in an area at risk of acquisition, parents should be informed about the risk of disease occurring; the possibility of the child receiving a WHO approved JE vaccine at the destination should be explored; and the risk and benefits of receiving the vaccine "off-label" in Canada prior to departure presented. Data from a small study of children vaccinated with 2 doses of IXIARO® demonstrated protective antibody response similar to adults and without unexpected adverse events. Preliminary data suggest the use of a half adult dose in children less than 3 years of age. spend more than a cumulative total of 30 days in rural areas during the season of risk (or in urban areas known to be endemic or epidemic for JE); including longer-term travellers or expatriates who, while based in urban areas, anticipate making intermittent short trips to rural areas of risk. spend less than a cumulative total of 30 days in rural areas during the season of risk (or in urban areas known to be endemic or epidemic for JE) if substantial activity outdoors (or indoors if the indoor area does not exclude mosquitoes) is anticipated, especially during the evening/night. entire itinerary will be in urban areas (unless the urban areas are known to be endemic or epidemic for JE). visits to rural areas (or urban areas known to be endemic or epidemic for JE) will be during the daytime only. JE vaccine is recommended for laboratory personnel who work with JE virus. Refer to Schedule for additional information. There are no data related to safety or efficacy of JE vaccine in pregnant or lactating women. Pregnant or lactating women who must travel to areas where the risk of JE infection is high should be immunized only if the risk of disease outweighs the unknown risk of vaccination to the woman and/or her fetus/breastfeeding infant. Refer to Immunization in Pregnancy and Lactation in Part 3 for additional general information. If travel must be undertaken, immunocompromised persons may be immunized with JE vaccine; however, the antibody response may be suboptimal and the person should be advised to be diligent about mosquito protection measures. When considering immunization of an immunocompromised person, consultation with the individual's attending physician may be of assistance. For complex cases, referral to a physician with expertise in immunization and/or immunodeficiency is advised. Refer to Immunization of Immunocompromised Persons in Part 3 for additional general information. Laboratory personnel who work with JE virus should receive JE vaccine. Refer to Immunization of Workers in Part 3 for additional general information. Each dose is 0.5 mL. JE vaccine should be administered intramuscularly. Refer to Vaccine Administration Practices in Part 1 for additional information. A series of two doses given on days 0 and 28 should be administered. The immunization series should be completed 10 to 14 days before potential exposure to JE to develop an adequate antibody response. An accelerated schedule is not available. However, if there is insufficient time to administer the recommended two-dose schedule before entering a JE risk situation, a single dose of JE vaccine may be considered and the vaccinee advised that protection against JE may not be reliable. Alternatively, simultaneous administration of two doses of JE vaccine (given with separate injections at separate injection sites) may be considered; however, the risks and benefits of this approach must be critically evaluated. A booster dose (third dose) should be given one year after the second dose in the primary series, when there is a potential for re-exposure to JE virus. Persons at continuous risk for acquiring JE (laboratory personnel or persons residing in endemic areas) should receive a booster dose 12 months after primary immunization. Data on the need for further booster doses are not available. If a person received the previous mouse brain-derived JE vaccine more than 3 years ago and requires re-immunization, a two dose primary series of the currently available Vero cell culture-derived JE vaccine (IXIARO®) should be administered. Serologic testing is not recommended before or after receiving JE vaccine. Store JE vaccine in a refrigerator at +2°C to +8°C. Do not freeze. Protect from light. Refer to Storage and Handling of Immunizing Agents in Part 1 for additional general information. Data are limited regarding the safety and immunogenicity of JE vaccine when given concomitantly with other vaccines. In general, inactivated vaccines, such as JE vaccine, can be given concurrently with any other vaccine using different injection sites and separate needles and syringes. JE vaccine has been given concomitantly with hepatitis A vaccine without significant interference with safety and immunogenicity. There are no data available regarding possible interference between JE vaccine and yellow fever vaccine. Refer to Timing of Vaccine Administration in Part 1 for additional general information. Refer to Vaccine Safety and Adverse Events Following Immunization Part 2 for additional general information. Tenderness or pain (about 34.0%), redness (9.1%) and hardening (8.0%) are the most common vaccination site reactions following JE vaccination. Common systemic side effects include headache (19.2%), myalgia (13.4%), fatigue (9.5%) and influenza-like illness (8.8%). Other reactions, such as vaccination site swelling or itching, rash, fever, and nausea are reported in 1% to 5% of vaccinees. Serious adverse events are rare following immunization and, in most cases, data are insufficient to determine a causal association. Anaphylaxis following vaccination with JE vaccine may occur but is very rare. No serious hypersensitivity reactions or neurologic adverse events have been identified among JE vaccine recipients enrolled in clinical trials. Vaccine providers are asked to report, through local public health officials, any serious or unexpected adverse event felt to be temporally related to vaccination. An unexpected AEFI is an event that is not listed in available product information but may be due to the immunization or a change in the frequency of a known AEFI. Refer to Box 1 in Vaccine Safety in Part 2 and Reporting Adverse Events Following Immunization (AEFI) in Canada for additional information about AEFI reporting. JE vaccine is contraindicated in persons with history of anaphylaxis after previous administration of the vaccine and in persons with proven immediate or anaphylactic hypersensitivity to any component of the vaccine or its container. The vaccine does not contain any preservatives. Refer to Table 1 in General Considerations in Part 1 for lists of all vaccines available for use in Canada and their contents. Administration of JE vaccine should be postponed in persons with moderate or severe acute illness. Persons with minor acute illness (with or without fever) may be vaccinated. Refer to General Contraindications and Precautions in Part 2 for additional general information. There are no data available regarding interchangeability of the currently available Vero cell culture-derived JE vaccine (IXIARO®) with the previous mouse brain-derived JE vaccine, either in primary series or in booster dosing. Refer to Booster doses and re-immunization for additional information. Refer to Principles of Vaccine Interchangeability in Part 1 for additional general information. Andersen MM, Ronne T. Side-effects with Japanese encephalitis vaccine. Lancet 1991;337(8748):1044. Beasley D, Lewthwaite P, Solomon T. Current use and development of vaccines for Japanese encephalitis. Expert Opin Biol Ther. 2008;8(1):95-106. Centers for Disease Control and Prevention. Japanese Encephalitis Vaccines. Recommendations of the Advisory Committee on Immunization Practices (ACIP). MMWR Morb Mortal Wkly Rep 2010;59(RR-1):1-27. Centers for Disease Control and Prevention. Recommendations for use of a booster dose of inactivated vero cell culture-derived Japanese encephalitis vaccine- Advisory Committee on Immunization Practices, 2011. MMWR Morb Mortal Wkly Rep 2011;60(20):661-63. Chambers TJ, Tsai TF, Pervikov Y et al. Vaccine development against dengue and Japanese encephalitis: report of a World Health Organization meeting. Vaccine 1997;15(14):1494-1502. Hoke CH, Nisalak A, Sangawhipa N et al. Protection against Japanese encephalitis by inacti-vated vaccines. N Engl J Med 1988;319(10):608-14. Jelinek T, Nothdurft HD. Japanese encephalitis vaccine in travellers. Is wider use prudent? Drug Saf 1997;16(3):153-6. Kurane I, Takasaki T. Immunogenicity and protective efficacy of the current inactivated Japanese encephalitis vaccine against different Japanese encephalitis virus strains. Vaccine 2000;18(S2):33-5. Novartis Pharmaceuticals Canada Inc. Product Monograph - IXIARO®. January 2012. Tsai TF. New initiatives for the control of Japanese encephalitis by vaccination: minutes of a WHO/CVI meeting, Bangkok, Thailand, 13-15 October 1998. Vaccine 2000;18(S2):1-25. Tsarev SA, Sanders ML, Vaughn DW et al. Phylogenetic analysis suggests only one serotype of Japanese encephalitis virus. Vaccine 2000;18(S2):36-43.